2012 Mazda CX-5 premiere - Mazda publishes first official images of its small crossover 2012 Mazda CX-5 a little more than a month before the presentation of the model of the Frankfurt Motor Show. “Soft SUV” five-door presents brand new style of “Kodo”, shown last year in Geneva with a concept Minagi. 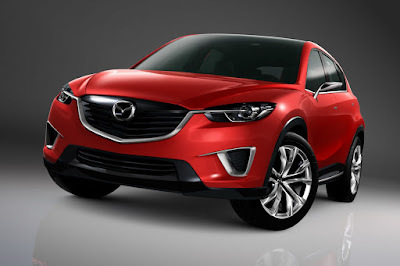 With the 2012 Mazda CX-5 debuted noisy discussed technology SkyActiv. European buyers of the new Japanese 2012 Mazda CX-5 will be able to choose between two-liter gasoline engine and diesel with a capacity of 2.2 liters. The compression ratio in both engines is 14:1, and the performance will depend on whether they order Standard package, or High Power. 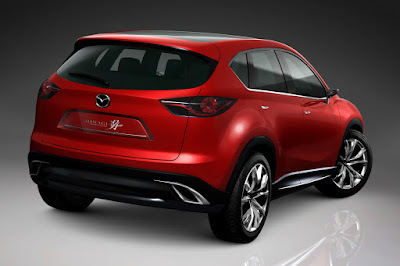 Whatever the translation, however, experts in automotive design now comment on the appearance of new soft SUV Mazda CX 5 with approval, as it compares with the previous not-so-loved style Nagare. Characteristic of him was excessive “smiling” face of the CX 5 in the range of Mazda.